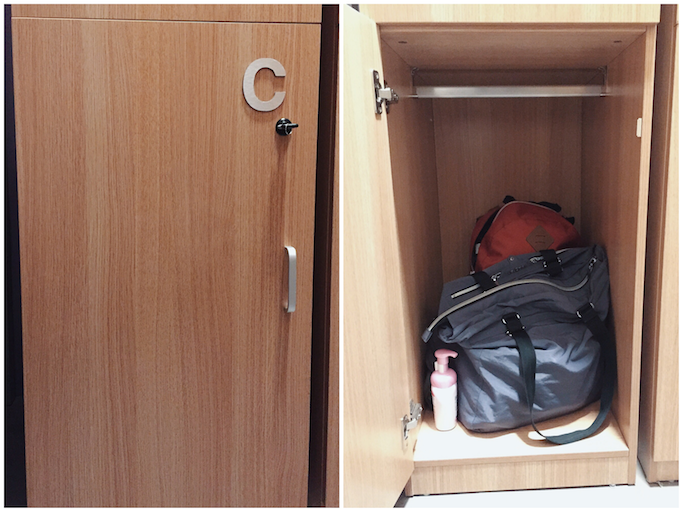 Finally found time to blog about my one month dorm life with Space EDSA! Last February 23, I decided to take the plunge and live at a new dormitory in the middle of EDSA. As with anything, there are upsides and downsides. But overall, the whole gig was a worthwhile experience for me, it made me learn a lot of things with this pseudo-independent living. Sharing here some of my stories! On my first day, while riding the bus with my backpack, I was already feeling anxious with the new set-up. I know I've tried living away from home back in college, but that felt like a long time ago. Actually, I was more nervous that my mom is nervous, haha! Kung ako lang, I was actually excited thinking of the convenience of living nearer my events. I got off the bus, and saw the dorm kaagad. It was an easy commute. There's a "secret" entrance for the dormers at the back of the building. Here's the lobby, where Kuya Guard on-duty is stationed. He knows all the dormers, and checks everyone who enters the vicinity. When I arrived in Space EDSA, the receptionist welcomed me from downstairs at the Major Homes building lobby. Space EDSA is actually just a small part of this building - just the second floor! But with good planning and architecture, they can actually house 184 tenants in 29 strategic rooms, with women and men rooms separated! Ang galing! So anyway, they assigned me to a room with two bunk beds (will fit four persons). At that time, I had the room to myself. I had neighbors, though! They showed me my bed with my locker next to it. I kept my bags inside before heading out to my event. On my first night, I woke up with a startle because of my neighbors banging their doors, hurrying for work. I think most of them are call center agents, never had the chance to talk to any of them. It was a bit irritating at first, but eventually, I got used to noises at 4 to 5 in the morning. There was a time na hindi na nga ako nagigising kahit mag ingay pa sila diyan, hehehe! It's a box-type, fuss-free room so expect no natural lights whatsoever. I sometimes like the privacy of my cold room whenever I blog, but there were days when I just take my laptop out in the common room, and work there with the rest of the dormers who were either chatting, watching TV, or eating. I usually go home on weekends or on Sundays juts to get new clothes and check deliveries. On my second week, I decided to bring more blankets and pillows. Space EDSA provides just one thin pillow and blanket per bed, and the rooms get really cold at night. I like it that way, though. On my second week also, they told me that a new tenant will join me in my room. I have to be honest though, I declined it politely saying I'll transfer nalang to a solo room, if it's okay. Not to be anti-social (haha), but I was also concerned with my multiplying things! Haha! As a blogger who gets press kits almost everyday, eventually the bed next to me became my extended cabinet! Haha! One time, I had a chance to see one of my neighbors' room when they left their door wide open - and saw how they make-do with the small space kahit 4-8 pa sila sa room! I saw makeshift sampayan, and huge plastic box containers that they can pull from under their beds. As with security - They gave me this tap keycard for my room and for the door leading to the women's section. I also have a key for my locker, and kuya guard on-duty never left his post at the lobby. CCTVs are everywhere in the main area and hallways. - Even with all the tenants, the place is generally clean! I place a paper bag in my room for my trash, which I dispose every morning at the big trash cans near the restroom. They collect these also everyday. - There's a 7Eleven just downstairs, and a short walk to Chowking! - Location-wise, it is the most convenient place I've stayed in. Space EDSA is located in between Boni and Shaw MRT Stations, right next to VRP Hospital. I just ride a bus going to Megamall, and even walked once to Shang! Tricycle to the MRT is just across the building. Living in Alabang, it takes me 1.5 hours travel time everyday. But during my one month stay in Space EDSA, nauuna pa ako makauwi sa mga friends ko! Haha! I was never late for events because of the available side roads and route options to avoid traffic. It was easy for me to take breaks in between a morning and night event, meeting, or class (and leave my things muna). And I had lesser fears in commuting back to the dorm kahit na late na. - Friendly staff. Dito wala akong masabi! During my whole stay, they were always willing to assist to my needs. I felt at home right away. I received greetings whenever I enter and leave the vicinity. Our receptionist even accepted packages delivered to me when I wasn't there. Also, when I needed a space for my TV "shooting" rakets, I just asked permission and they allowed it in the common room and even helped me with the necessary logistics. I can't thank them enough for this! Megamall is just a Php 12 bus ride away! I spoiled myself weekly with Halal Guys, Yabu, and French Baker! Haha! - Nabibilang lang naman these things, but one of them was when I was caught in a brownout while I was having a shower. It took one long minute before lights came back on. Medyo natakot ako dun! - Sometimes shower and toilet areas were not that clean, but I guess that's the dormers fault na. - Small space for my many things, but as mentioned earlier, you'll learn space saving techniques. - Noisy neighbors with different wakeup calls, but then again you'll get used to it. - I was not a healthy eater during my one month dorm life! 7Eleven is just downstairs so sometimes yun na ang dinner ko. - With the hot and cold shower problems in the ladies' shower room, Kuya was still the one who assisted a fellow dormer. Medyo weird sakin to have a guy in the ladies shower room, although Kuya naman is nice and not shady so I just let it go. - Lastly, also in the shower room, I almost took off my clothes when someone knocked on my cubicle's door... and it was still Kuya! I learned that may repairing going on katapat ng window ng dapat pag shoshoweran ko! Buti ang tagal ko kumilos fixing my clothes and toiletries, huhu. I just left and showered super fast sa kabilang dulo. The notorious shower cubicles, hehehe! I always take a bath din at night before bed, so I got used to this common / shared set-up. Overall, it wasn't that bad naman. The lobby, where I pass by heading out and going in. This huge mirror is where I see my fellow dormers double check their outfits and makeup before heading out, hehe! The common room where dormers interact, eat on their own, charge their gadgets, and watch TV. Guests are welcome here but at a certain time frame only. The kitchen where dormers clean their plates and utensils, store their food in the small ref (I did this once, wala namang gumalaw), and use the microwave. No cooking allowed. I maximized their hot-cold water dispenser where I refill my jug everyday. They also have a free 24/7 gym with all the basic equipment you will need! Sayang di ko ito nagamit ni-once! 1) Budget is key! I lived on my own with what I earn, so it is important not to splurge too much. I balanced my Grab taxi rides with bus and tricycle rides, Halal Guys with Chowking, and Starbucks with 7Eleven coffee! 2) I also learned to maximize the things that I have. Since I can only bring few clothes for a week, I learned to mix and match and go for basics. 3) Space EDSA taught me to co-exist with different kinds of people. To interact with fellow dormers and dorm staff, and at the same time, respect other people's personal space and things. Know the rules, but also know your rights. 4) Organizing is not my biggest trait, I am not super OC, but living in a dorm meant that I have to always keep my things in order, throw away the unnecessary and pampasikip lang, and also to be maingat in using their public facilities (gym, common room, kitchen, restroom). And last but not the least, 5) I also learned to watch over myself and be extra responsible. Although Space EDSA has tight security measures, it is safer to be a little bit praning - to double check the locks of my doors at all times, check shower and toilet area, keep my valuable things inside my locker, and not leave my keycard anywhere. Be friendly, but still cautious. I realized that I didn't even abused my "no curfew" privileges! Also, I have to wake up on my own, do things on my own, feed myself everyday, etc. In short, I have to keep myself healthy, happy, and safe at all times! I unceremoniously left Space EDSA with a heavy heart (and another anxiety attack! Haha). With all the events and life happenings, one month went by in a blink of an eye. Kuya said goodbye while dad helped me carry my backpack and extra pillow and blankets out of the door. I heard them saying, "Balik po kayo!". It was an irreplaceable experience that I did for myself and for my dramatic purpose to gain "personal growth". In a way, it is comparable to traveling where you intentionally expose yourself to things that you're not used to. Not the type to be boxed, I like that feeling from time to time. Independence is sweet. Yes, if you want to have a feel of independent living but currently on a budget, Space EDSA dormitory is your best bet :) Let me know if you go about with it!